- Leave both pastry to rest for about 20 – 30 minutes. - After resting give the water pastry a quick knead till the dough is smooth. * I preferred to use a bland vegetable fat for flaky pasty. I used to use Crisco a vegetable shortening from USA, but due to hydrogenated fat and unavailability, I find Trex (tasteless and no hydrogenated fat) is as good. You can use lard if you wish but to me making a malay snack with lard just doesn’t feel right with me. Butter is ok but I find the taste a bit strong for this type of S E asian pasties. ** You can use the same flaky pastry for any filling. Great for Chinese char siu flaky triangle you find in dim sum restaurant. - Fry onion with few tbsp of oil for few minutes add curry powder, chilli powder and tomato puree, fry till fragrant then add meat and brown for few minutes. - Add potato dices and stir, sprinkle with water to keep the mix moist and help the potatoes to cook. Cook for about 10 minutes till potatoes are cooked. 1. Divide both pieces of dough into two. 3. Take half of the greasy dough and cut into pieces and dotted all over the rolled out water dough. 4. Spread the grease dough with spatula till even and smooth. If you are struggling, wet the spatula with water will help spreading. 6. Roll and stretch to extend the log to about few inches longer. 7. Cut into half. Roll and stretch one half (aim for around 3 cm diameter) then cut into about 12 pieces. Repeat with the other half piece. 8. Repeat steps 3 – 7. You now have about 48 - 50 pieces of dough, cover to prevent drying. 9. Take a piece of dough, with the cut size on the side, press down with fingers then roll to an oval disc. 10. Fill the disc with about 1 tbsp of filling. Slightly dampen the edge (half the disc) with water. Fold the pastry over to form a half moon shape. Press the open edge together then crimp. 11. Continue making the puffs till finish. This will take sometime. Lay each puff on non stick baking tray. If using baking tray without non stick, line tray with parchment paper then the puffs. 12 Brush each puff with beaten egg. 13 Bake at about 190 – 200 deg C (fan oven) for about 20 - 25 minutes or till golden brown. I don't have any detailed photos or video made at the moment. I will try to include one in when I make some later. Watch this space. 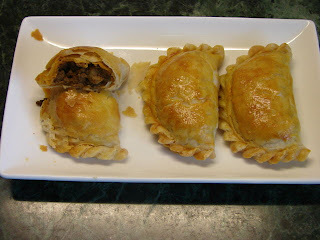 Oh, I just went thru a few more or your recipes and found a detailed slideshow on the crimping process in your Epok Epok recipe. Thank you! I'll have to try it soon! Oh I forgot about that! Hope that helps. I am going to make some Cantonese 油角仔 fried peanut croquettes for CNY. Hope you will join me.